The design and testing of original instruments and software for bioacoustic research is one of the most important and most appreciated CIBRA activities. Before the establishement of the Centre in 1989, bioacoustic research was carried out within the research programs of the Institute of Entomology. Bioacoustic research began in 1980 with the developement of a computer based digital spectrograph. It was the first one in Italy dedicated to the study of animal vocalizations (DSPW History) and allowed the first experiments of digital analysis on animal sounds in Italy. Initially, it was mainly used for experimentation, bird song analysis and microseismic studies. In 1984 the first analyses on fish sounds opened the pathway to the development of new instruments and software for underwater bioacoustics, mainly on fishes and marine mammals. The equipment developed in the period 1980-1983 required 45 minutes to produce a 1 second long spectrogram. Now everything works in real-time on a cheap laptop! 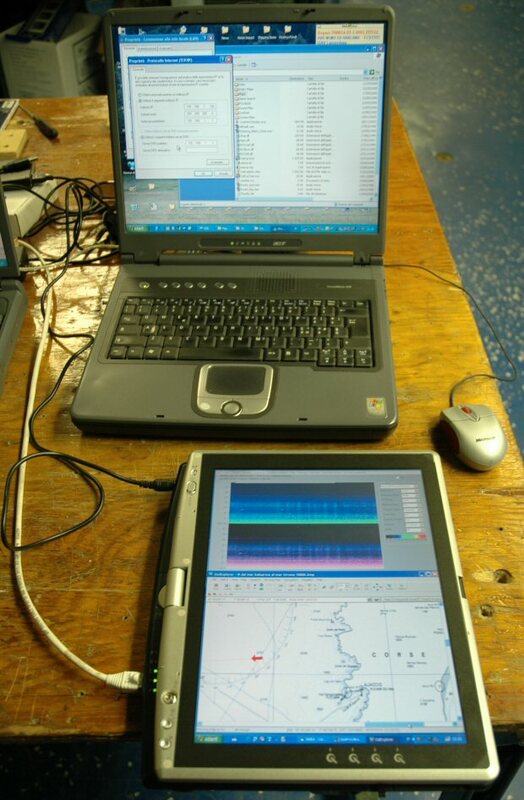 The SeaPro software supports many screen configurations, including rotated displays like those available in Tablet PCs. GPS information and audio data can be distributed through network connections, either wired or wireless. The PocketPC recording set assembled at CIBRA is based on the excellent hardware (PDAudio CF for digital I/O and Mic2496 preamplifier & AD converter) developed by Core-Sound and the software Live2496 developed by Gidluck Mastering. The Mic2496 has been put in a new case to host XLR connectors and two 9V batteries. 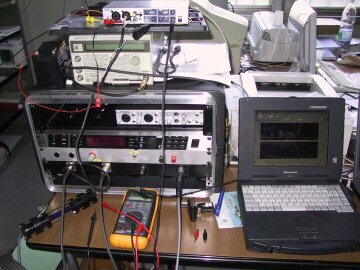 The microphone interface box and the PocketPc can be velcroed together for easier use in the field; they are connected by an optical cable. 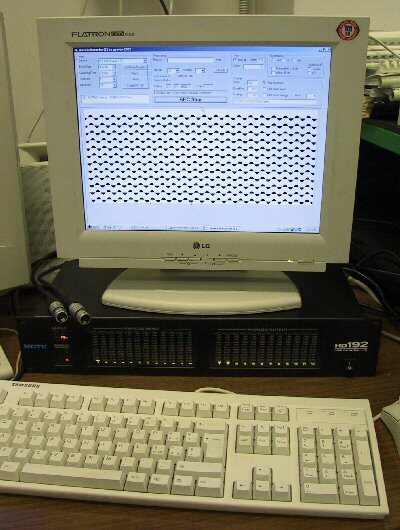 The system allows to record up to 192k sampling rate on CF memories like those used in digital cameras. A small solar panel allows to charge PocketPC batteries in the field. Another option allows to record digital data coming from the Mic2496 to a M-Audio MicroTrack 2496, a pocket CF recorder with both analog and digital inputs. This system is now replaced by pocket-sized solid-state recorders. The multichannel recorder has been developed to allow recording and processing multiple transducers at once. The basic version allows to record up to 24 channels with sampling rates up to 192 kHz and bit depth of 16, 20 or 24 bits. Supported .wav file formats are 16 bits, 32 bits integer and Float. If a suitable array of sensors is available, either microphones or hydrophones, a real-time beamformer display shows the direction of incoming sounds in real-time, without appreciable delay. The software requires a true multichannel board with multichannel driver (some multichannel boards have drivers able to manage channels in pairs, not all together). A special version has been developed for the INFN ONDE Project to read and get synched two stereo digital streams coming from the deep hydrophones located 25 km off the port of Catania. Special software is being developed to allow automatic triggering and bearing measures on relevant events. 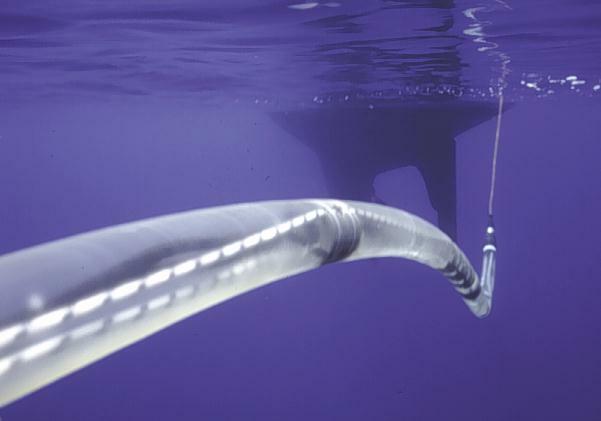 It is well known that the most critical link in gathering acoustic data is the sensor itself. When we developed the first truly portable real-time DSPW (in 1990) it emerged the need for improved sensors, in particular for underwater bioacoustics, the study of marine mammals and, more recently, for the implementation of mitigation policies. After two years spent experimenting with variopus hydrophone systems, a towed "dipole" array of hydrophones was was designed in cooperation with Alenia Elsag Sistemi Navali and built by Alenia and USEA to meet specific requirements of our research, such as reliability associated with a high acoustic quality. The designed array is easy to deploy, and can be operated from non specifically equipped vessels as it does not require a winch. The array works well either on small vessels, thus making it possible to work with small budgets, or on large oceanographic ships. 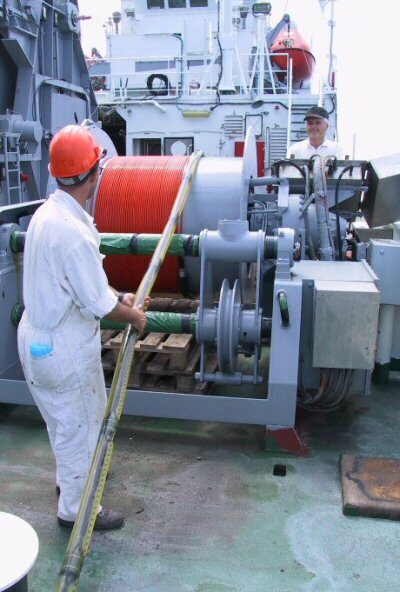 The towed array consists in an oil-filled hose which is 12 meters long, 6 cm in diameter, and holds two groups (mini-arrays) of acoustic transducers, their preamplifiers, and a pressure transducer. 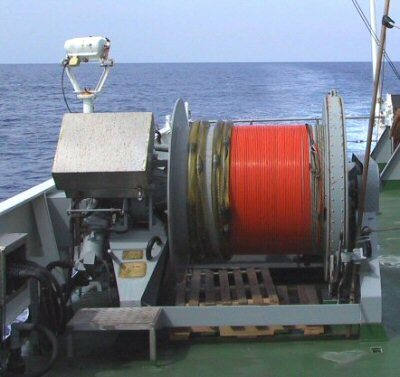 The towing cable is 150 meters long. The two mini-arrays, made of three acceleration cancelling transducers each, are positioned 8 meters from each other. Flat frequency response to more than 40 kHz and low self-noise are the two key-features of the array. The mini-arrays can be operated with the three transducers in parallel, in order to achieve a directional reception and to attenuate longitudinal noise, or by selecting only the central transducer of each array to get omnidirectional sensitivity. A custom electronic controlling unit was designed to provide power to the array and to amplify and filter the received signals. A depth-meter, connected to the pressure transducer in the array, displays the operating depth in real-time (at 4-5 knots the average depth is 22-24 meters) so that it is possible to evaluate the timing of surface reflected echoes. The whole instrumentation, that initially included a portable PC-based DSP Workstation and two DAT recorders, was powered by batteries and photovoltaic panels, thus allowing a complete autonomy from the host vessel power source. Designed in 1992 it was first deployed in summer 1993 and since then it has been used every year with very little maintenance needs. With the latest improvements in the DSPW, the interface to the array has bee redesigned to be smaller in size and with larger bandwidth. The interface electronics now allow more than 80 kHz bandwidth and a digital filter equalizes the response at the resonance frequency of the ceramics (42-45 kHz). The array can be now connected either to a desktop PC or to a laptop to allow continuous recording to hard-disk and real-time spectrographic display. Connected to the current CIBRA PAM DSPW is a powerful tool for both research and mitigation needs. Even if the ALENIA array is still the core equipment at CIBRA, new towed arrays prototypes have been designed and built by CIBRA and NAUTA to have a backup equipment and to experiment new techniques and new hydrophone configurations to better achieve PAM requirements such as bearing and range estimation. The towed array of hydrophones developed by CIBRA and ALENIA (Picture courtesy of D.M.Rossi).